I can’t pass up BBQ. Seriously. I just can’t drive by good BBQ and a few weeks ago, a new BBQ place opened in downtown Grand Rapids just in time for Artprize. As much as I try to stay away from downtown during Artprize unless I have to go down there for work, I just couldn’t pass up BBQ. 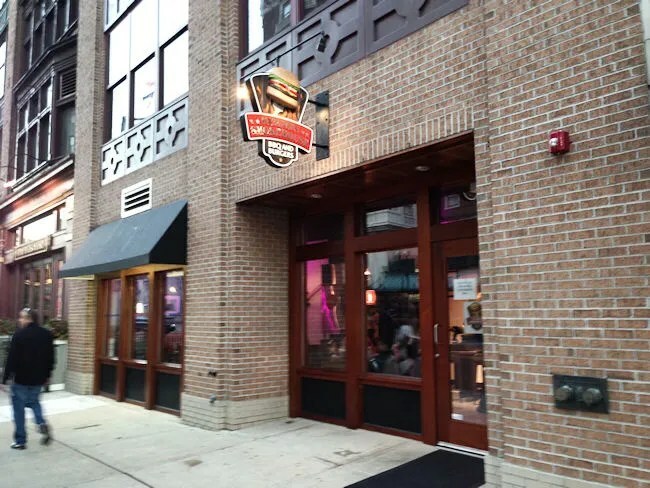 Memphis Smokehouse takes over the storefront recently vacated by Donk’s Mexican Joint (or Taco Boy) on Monroe Avenue right across the street from the Amway Grand Plaza Hotel. 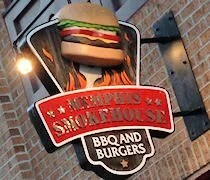 Memphis Smokehouse has a small menu of Memphis BBQ favorites and gourmet burgers. The restaurant itself is pretty small. There’s only room for a dozen or so people to eat in, but the location in downtown lends itself to carry-out and eating outside. I stopped in to Memphis Smokehouse because I saw the sign for BBQ, but the burgers seem to take center stage. They’re a gourmet burger at a “reasonable price.” I went back and forth, but eventually, I stuck with the BBQ. I chose the Slow Smoked Pork Sandwich and an order of Homemade Idaho French Fries. I was offered a drink which actually would have made my meal cheaper…but they have Coke, so I passed and just paid the little bit extra. I suppose I could have just tossed the drink, but I didn’t think of it until later. The order process is similar to a fast food joint with an order counter right as you walk in the door. After a few minutes, I saw my meal thrown up on to the counter where it was bagged up and handed to me. In all, it took me longer to find a parking spot downtown than it did to get my dinner. I started in on the fries right away. 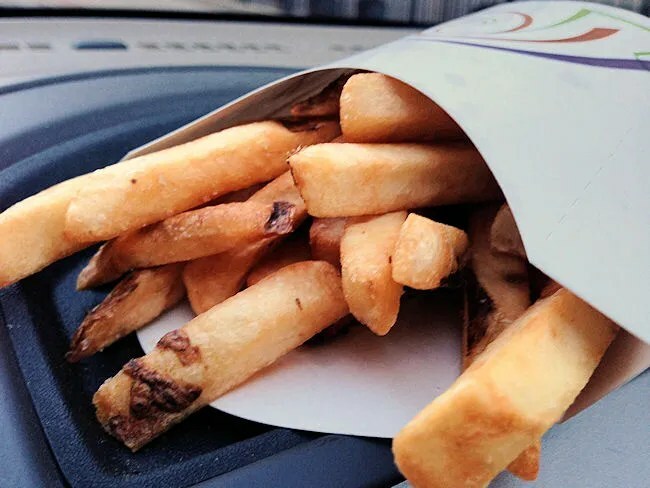 They’re fresh cut fries that still have the skin on and are deep fried to a crisp outside with a chewy, potato-y inside. It didn’t take me long to finish the order as most of them were gone before I even made it back to my car. When I got back to work, I was finally able to unwrap the foil that was doing a horrible job of keeping in the hickory smoke smell that was wafting from the meat. It was horrible driving with that sandwich in my car. The smell was too much…I wanted it..and wanted it now. The sandwich was mostly bun which was pretty disappointing, but the meat that was there was delicious. It was smokey delicious and topped with a thick, sweet BBQ sauce. The sandwich was really good, but I walked away from it still hungry..granted, I am a big guy. I wish there was a little more meat on the sandwich, but other than that small detail, the sandwich was delicious. 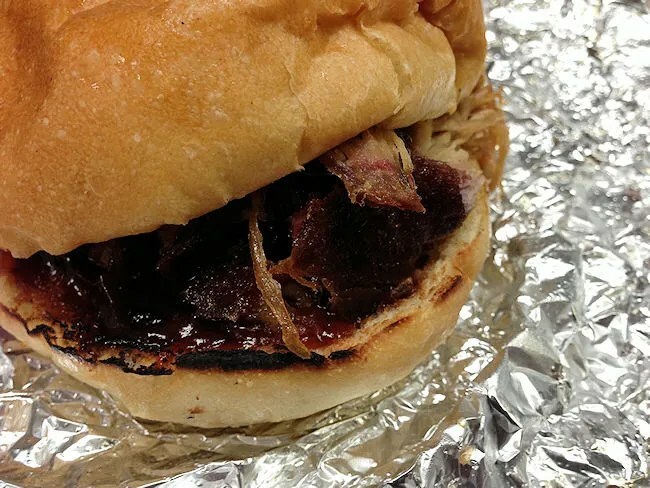 Memphis Smokehouse is a really good option in the downtown dining scene. They offer something you can’t get downtown and they offer it in a gourmet quick service setting.